This 15th century carol dates back to the reign of King Henry V, when the vernacular tongue of Middle English began to come into its own and replace Latin on court documents. It was originally part of a Mystery Play, a dramatic performance used as a visual catechism for the common people, and it tells the story of Adam’s Fall as it relates to The Incarnation. Adam's sin, it is purported, actually had “blessedness" since it set into motion the process by which God became a human being to share the supreme intimacy with us and ransom us again. Also, it prepared the way for Mary to become the "New Eve” and later The Queen of Heaven, our special advocate on high. Another medieval carol, this one refers to a Christmas tradition continued into modern times at Oxford University. Legend has it that a student from Oxford was walking through the woods on his way to midnight mass. Suddenly, a wild boar charged out of the shadows and attacked him. The student promptly produced his silver-gilt Latin Psalter and struck the beast on the head with it. The boar’s was taken back to Oxford where the student and his friends enjoyed a lavish celebration in thanks to God for his preservation and quick-thinking. Every year afterwards on Christmas Eve, the tradition was kept alive. This carol used to be part of another Mystery Play put on in the city of Coventry, the rest of which has been lost to posterity. The lyrics are somewhat difficult to interpret word-for-word, but it is essentially a lament by the mothers of children were slain by King Herod during his hunt for The Christ Child. Hence, it is actually is actually in honor of the Holy Innocence, although some mistakenly believe it is referring to Baby Jesus. Actually, some of the verses could apply, taken into consideration His Passion to come. Everyone knows this song, but few know its original purpose. Dating from between the 16th and 18th centuries, it sprung up in the streets of London and was sung by town watchmen to the gentry of the vicinity. This act of Christmas merry-making would earn the watchmen extra money during the Yuletide. 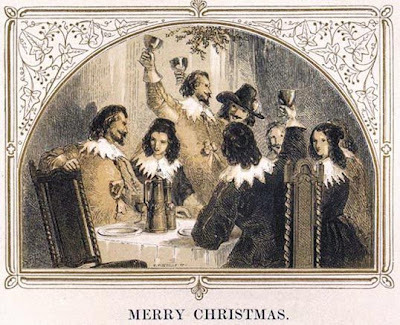 As a final note, "God Rest Ye Merry" was a traditional greeting dating back to the time of Shakespeare. This nursery rhyme-like ditty alludes to a legend about The Christ Child and The Virgin Mary visiting Britain with Joseph of Arimathea when he worked as a tin-trader for Imperial Rome as a tin-trader. Cornwall has is often identified as one of the main places they stayed. Joseph supposedly returned to Britain after the death and resurrection of Christ and planted the miraculous Glastonbury Thorn. It was said to have blossomed every Christmas and Easter. Even though the destination this carol is clearly Bethlehem, the reference to Jesus and Mary traveling on board ships is indicative of other journeys. While this isn't a carol per se, it does refer to a Yuletide tradition of particular significance. The word "wassail" comes from an old Anglo-Saxon term meaning "good health". A pre-Christian custom of “wassailing” apple trees involved sprinkling their roots with cider in hopes of a good harvest the next year...and to scare away any wood-nymphs who might be loitering around the vicinity! The better-known form of wassailing involves marching through the streets with a bowl of spiced brew and singing songs that request entry into houses to partake in the Christmas feast. With a wassailing bowl we'll drink to thee! With a wassailing bowl, we’ll drink to thee! With a wassailing bowl we’ll drink to thee! For to let these jolly wassailers in! So the next time you’re at church with a hymnal on your lap or at a Christmas party with a mug of nog in your hand, relish the songs of this jubilant season and remember the stories behind the carols. They just go to show our mother country wasn’t called “merry” for nothing! "With a wassailing bowl, we'll drink to thee....."
Christmas songs, Christmas songs, Christmas songs! You've got me excited, Pearl (in case you can't tell:). "I Saw Three Ships"! "Coventry Carol"! And I think "Wassail" is the name of the really lively song whose lyrics I've never gotten my hands on. We danced to it in "A Christmas Carol" at Fezziwig's party. And thanks for having introduced me to "Adam Lay Ibounden." Ever seen a fascinating little book by the name of "Christmas Songs and Their Stories"? It's full of fascinating stories like the ones you've related about the origins of carols. Like the melody of "O Little Town of Bethlehem" came to the composer in a dream... he described it as "an angel strain." Well, thanks for making my day with the Christmas songs! You and I really must have a phone conversation in which we talk more about music! That's neat about dancing to "Wassail" in "A Christmas Carol" for Fezziwig's party. Do you do plays as well as English Country Dancing? Or did your dance group put the plays on as part of the program? I'll have to look up the book you mention; it sounds right up my alley! We can talk about it further over the phone soon! Yes... now if only I were actually capable of choosing ONE favorite Christmas carol. But I'm afraid it can't be done... how about you? Can you pick one favorite? I do do plays in addition to English Country dancing; they aren't really connected. This particular dance, while based on English folk dance, actually irked me in places for breaking common dance laws - but I was the only one who knew them, and I wasn't the choreographer! For instance "The lady is always right, and the men take what's left," signifies the proper position of couples in a set. The dance was great fun though - I wish I could send you a video! Let me know if you're able to find the book (it's a rather old one) and I look forward to our next conversation!